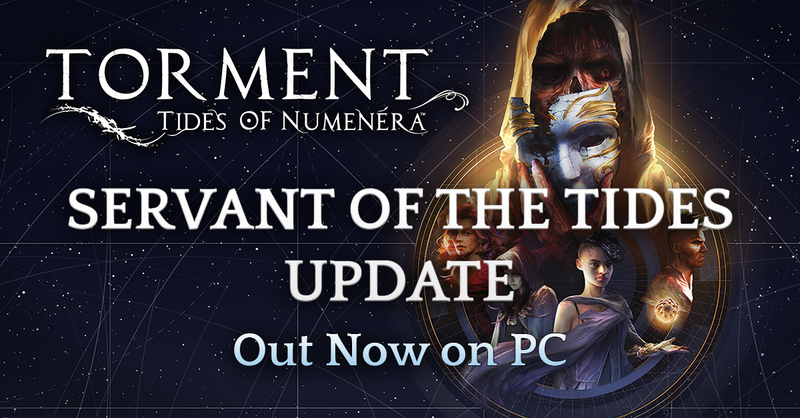 Today's backer update from producer Eric Daily brings news about a new party companion, the latest patch, some amazing offers, and a check-in on backer rewards. - New Companion: Oom. Oom is a new stretch goal character who you will discover on your journey through the Ninth World. Oom features its own companion quest, "Servant of the Tides", its own unique abilities for use in combat and exploration, and interactions with various characters throughout the game. - Added the Voluminous Codex. This new stretch goal feature unlocks lore and character entries as you explore the game world. - Added a new user interface element to the Inventory Screen which makes it easier to view companion attitudes toward the Last Castoff. - Added a new user interface element to the Common Panel which better messages the Last Castoff's current Legacy. - Players can now advance to Tier 5 and Tier 6, allowing players to spend their Experience Points more in the later game. This also allows the Last Castoff to gain abilities from other character types. - Various balance improvements to Crisis gameplay throughout the game. - Various balance improvements to exploration gameplay, especially in the later stages of the game. - Added zoom in/out key binding to the Options Menu. This allows players without mouse wheels to remap the zoom functions. - Cypher Sickness initialization is now delayed until after Equipment initialization. This should prevent issues where loading a save file where equipment was preventing a cypher explosion would cause input to freeze up (fix may not be retroactive). - Remove all non-gameplay Fettles from companions when they're removed from the party. This should prevent certain freezes from occurring. - Numerous small UI fixes. - Numerous small quest fixes. The most annoying bug is not fixed? Tol Maguur doesn't respawn if you kill her for enslaving Rhin, despite the options that clearly indicate that she would respawn. So the player either loses the Tidal Affinity storyline options in the largest section of the game or the player has to accept humiliating options (plead with the kidnapper and slaver of the player's own adopted daughter, allow the slaver to insult the player, offer Tybir as a prostitute and and even allow her to attack the player with a Tidal Surge). I know for sure that the developers were aware of the bug, because not only did I post it in the Technical forum and file a bug report, but someone had already publicized the bug and Colin had even responded on that thread so he definitely had seen it. I'm disappointed in you guys. What does our feedback matter? Wow, I knew they were talking about adding Oom, but that was faster than expected. Bringing back the Voluminous Codex is a surprise too. Almost as if inXile was directly responding to the fans' biggest issues with the initial release! Wow, that is a lot, thank you guys. I think I speak for everyone when I ask, did you guys fine tune final battles of Miel Avest and Bloom? They announced they were working on this patch two months ago and only two KickStarter updates ago. Hardly unexpected but welcome obviously. Time to go find a toy! I am upset in a major fashion at the moment--Steam is suddenly telling me that my OS (WIN10x64) is *not supported* and that the OS no longer supports Tides--except I have been playing on Win10x64 Insider builds, now on 16193, since the first day the game hit Steam. Without incident. What is going on??? I have validated the files, deleted and downloaded and installed the game again--and am getting the same result. All of my other games are working fine on this build as far as I know. I have been gaming for 30 years + and I've never seen an error like this--not from Steam, not from anywhere. 1.01 and 1.02 ran fine. Wanted to add that Win10x64 itself also tells me that it's not a Windows 10 app with this warning: "This app cannot run on your PC". No override is supplied. Update: After an entire afternoon spent troubleshooting yesterday, I tried something I wish I had done first--I downloaded the game to my wife's 15063.296 build of Windows10x64 (the commercially released "Creator's Update")--and what do you know--it fired up perfectly! I'm 99% sure at this point that the problem lies within the Insider's builds Microsoft has published since then--I am now on build 16199 (installed yesterday) Insider's of Win10x64--and I cannot run the file. I even copied the game executable from the wife's machine and brought it over to my machine and replaced the original game executable--and no go! So the cause is not file corruption. So....although the problem is one I have never seen before nor had happen before, I'm sure it is on *my end* and that the current Windows Insider builds are to blame for the faux incompatibility...I have reported this to Steam and also to Microsoft in the Insider's Feedback application! This one has been a doozy. Having said all of this, if anyone who reads this is running 16199 and Tides 1.1.0--please let me know...so I can move back to square one...! Of course, as luck would have it I don't have Civ VI, but I'll make the wild leap that Tides is "a game such as Civ VI" in some respect, somehow... I have no clue as to what Microsoft means by that phrase...! Last edited by waltc on May 19th, 2017, 7:13 am, edited 1 time in total. Great news and thanks for post-release content update ! Wasn't expecting it that early, I would have delayed my 2nd playthrough if I knew... but well I'll do a third playthrough probably somewhen in the summer. Huh. So, Tybir's Resourceful Cypher limit bug still isn't fixed? Tricky one, it seems. Good luck, then. Just recently saw this video. That's very cool. Thank you so much!